It is the time of the year again for the Fashion Royalty convention. It is the 6th Jason Wu event, taking place in Chicago, one of my favourite cities (and the only US one I have ever been to). Jason is celebrating the 10 years he has been in the fashion doll business and the concept of this convention is that iconic dolls and outfits of the past years will be re-done in a fresh style for this collection. The transformation of Gene into 12" dolls was apparently successful, so the next 16" line of Integrity received the same treatment. The LiveWire Clone is a good looking miniaturization of the LiveWire AvantGuards doll in 12 inches. This mini model has captured every detail of the original, from the afro wig down to the embellished platform shoes. The sculpt is Natalia's and the body is from the Monogram line. I would love to get this one since I do not have the original AG Livewire doll and also any Monogram ones but it depends on the price - and I already have a Natalia with this sculpt. I also think that the outfit does not translate well to this scale - the size of the sequins is enormous. The doll can wear the wigs from the Pompadour collection. Nu.Face's Giselle is wearing a beautiful re-interpretation of Véronique's Iconic lingerie from the first collection. Dominique is the cousin of Adèle Makéda, who modeled the original lingerie set. Dominique's lingerie is an updated version of the black set that her cousin wore. 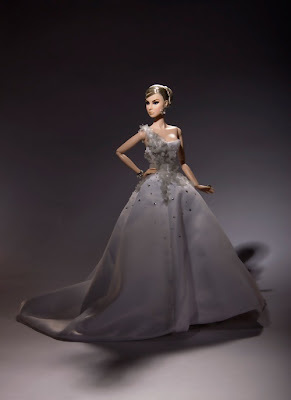 Eugenia has become a favourite character for many Fashion Royalty doll collectors. Eugenia pays tribute to her cousin in this updated version of Véronique's Silver Society fashion. Dressed in black from head to toe, Eugenia can go anywhere in this elegant fashion. 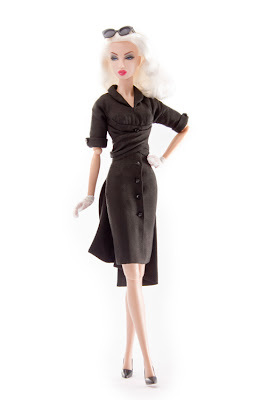 The original Silver Society Véronique is a very sought after doll and fashion. Eugenia looks brilliant in this - both doll and outfit are exquisite. Lush Life Véronique has been a holy grail of many Fashion Royalty doll collectors. This re-editioned version puts a totally modern spin on the gorgeous gown. Vanessa looks lovely and, together with Eugenia, make the best dolls of the convention collection. With the Poésie Enchantée doll, Integrity mixes two collectors favourites: a re-invented Poésie Sans Couleur gown with event-exclusive character Baroness Agnes Von Weiss wearing an one-shouldered embellished gown. She looks great and reminds me a lot of Dressing The Part Agnes. Thursday was the first day of the convention. Excitement filled the air when each convention guest was given a Fashion Royalty gift box as part of their registration swag. All were told that during each event they would receive a different component of a gift set as part of their table gifts. By the end of the convention, each guest will have built their very own full Fashion Royalty convention gift set (which is in addition to the main convention doll). Which Fashion Royalty character will star in this set? We will have to wait and see. My guess is Veronique or Adele (depends on which one will be the convention doll). Each guest found the first part of the gift set, a darling pale blue cocktail dress, waiting for them as they sat down to the first event. Did the gifts stop there? No! There was also an ITBE doll, named Chic, given out to each attendee at the convention. The Thursday night centrepiece was a huge crowd favourite, the Baroness Agnes Von Weiss in Silver Zinger (combining Agnes and Red Zinger Daria's outfit). The guest speaker for Thursday's event was Mel Odom, who surprised everyone by unveiling another future style in the Hollywood Royalty Gene collection (another 12" mini). No pictures were released of this Gene. Friday was another jam packed day for guests at the convention. The Friday luncheon was dedicated to one of the latest line of Integrity dolls, Poppy Parker. 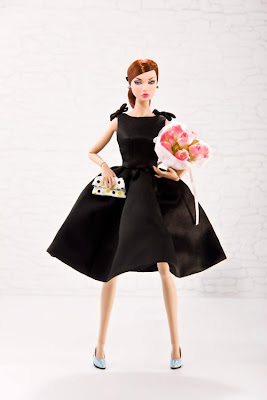 The mod styled doll made multiple appearances at this event. Poppy was the centrepiece doll: The Centre of Attention was presented during the Poppy Parker-themed luncheon. Then, every conventioneer got to walk away with their very own Poppy Parker Endless Summer doll as part of the event swag. A sneak peek photo for a future Poppy Parker Gift Set was also flashed across the screen for attendees to see. The Design-A-Doll Studio, a new addition to the schedule this year, was a huge hit! Convention guest "designers" proudly showed off their creations and many gorgeous dolls captured the hearts of the attendees. This year, a Friday night dinner was added to the convention agenda. Guests were encouraged to dress in their wildest couture creations. 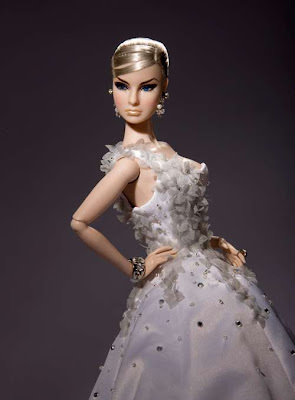 The centrepiece doll was a FR Monogram doll and she looked very elegant. The FR Monogram series has become very popular with collectors and the centrepiece doll, called Curiosity, was no exception. Convention guests were given the exclusive convention fashion, Successful Ascension, at this event as well. Black lace on a red and black outfit - I love the bag. looks like accessories are returning to outfits. The final day of the convention was another busy day, full of activities. Guests had workshops, the Museum, the Souvenir Shop, the raffle room and the Design-A-Doll Studio to take in on this final day of the convention. Guests also had the opportunity to view the incredible competition entries. Every attendee could vote for their favourite doll but had to wait until the final evening's event to know which entry won. The W Club luncheon proved to be, yet again, one of the highlights of the convention. After the ballroom doors were opened, members were able to discover the AvantGuards Vanishing Point centrepiece doll. Guests were given a wig and shoe set as a special gift for attending the event and the chance to purchase the centrepiece doll as well. There were a number of items on display during the luncheon, including Fashion Fuel, the W Club exclusive AvantGuards fashion and a brand new Integrity Toys Direct Poppy Parker gift set (the one that was sneak-peeked at Friday's luncheon). Information on pricing and when the gift set will be released will be announced later; meanwhile here are a few photos for you. While some Poppy Parker dolls have yet to arrive (the Reluctant Débutante more than won her name), Integrity releases even more new Poppies. So, among some other sneaks (including a Jordan and a Natalia doll as Integrity Direct Exclusives), attendees were privy to some sneak peek photos of 3 new Poppy Parker dolls that are scheduled to arrive in January. Let's hope that they are not as reluctant as some others are! The Saturday night ballroom looked magical as guests entered to see that the centrepiece doll was another new star in the Integrity Toys line up...Dania Zarr in Optic Clash. Every attendee wanted the chance to purchase this beauty - she looks smashing in this colouring. Check doll number three as the best of the convention (along with Eugenia and Vanessa). And she looks so YSL to me. Not only did each table look incredible, but the final piece to the Fashion Royalty Gift Set was also waiting for each attendee. The character was none other than Natalia Fatalé! Natalia looked ravishing in her pale blue lingerie, her long, flowing mane of red and her fine porcelain complexion. The story goes that Natalia had been busy developing a skin lightening formula and decided to test the cream on herself (her assistant refused and was promptly fired, LOL). She looks great but to me, the main attraction to her is that she is a Latina girl - take that away and you have one more Caucasian girl in the line, no pizazz (does anyone else see Scarlet Johansson?). So while the experiment looks fine, could do without her. This completed gift set is called Power Game Natalia Fatalé and contains a complete mix-and-match set of fashions and accessories for every convention attendee. So the moment all had been waiting for arrived. With thunderous applause, Jason unveiled the exclusive Jason Wu Event VI convention doll....Elise Jolie in Blue Blood! This new character has an important tie to Veronique's past. As the story goes, Elise is the daughter of Veronique's former finishing school teacher, Mademoiselle Jolie. This doll is a re-incarnation of the Voyages series, which explains the luggage. A corset-styled top is also included. She looks great in these official photos. All photos courtesy of Integrity Toys. Thank you so much for sharing this! It's one hell of a convention there this year! Great photos Strtos! JW makes the most beautiful dolls and clothes. I wish for a 16" Lana Turner someday. Richie the photos are from Integrity and the W Club! Τι υπέροχες που είναι όλες!!! Δεν θα μας αφήσουν σε ησυχία αυτοί, τις θέλω όλες, κυρίως την Eugenia, την Vanessa και την Agnes. Είναι και πανάκριβες. Μαρία, αν τις βγάλει το club για πώληση θα είναι σε retail price άρα προσιτές. ειναι η ωραιοτερη συλλογη φετος! οι vero ,dominique , siver zinger και ολες οι poppies μ αρεσουν τρελλα.Thanks for posting them Stratos και χρονια πολλα! Ευχαριστώ Ισιδώρα - Βέρο δεν είχε φέτος αλλά όντως είναι πανέμορφες όλες! OMG those dolls are so glamourous.. I am an avid collector of AA fashion dolls. I am now over 200 dolls in my collection. I have among them Both the 12" AvantGuard doll un boxed and the FR Evening Glow Dominique. I came across your page by chance and found bit it and your interesting. I two am a design but of clothing, who never completed his degree. I am happy to say I am currently back in school working that out. I have not been to Greece or Chicago but have friends in both places.